Look horribly damaged, don't they? They don't look like they have any pages. That would be seriously damaged. The books look awesome. 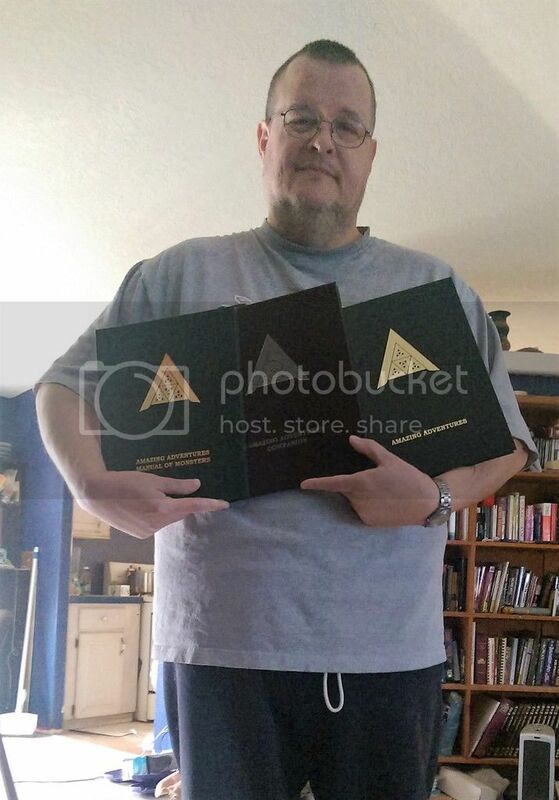 The guy holding the books looks damaged. You know, I told my wife almost the exact same thing! You beat me to it !!!! & that is why you all will never see a picture of me !!!! That said, great looking books you have there. Glad you like them! I've never been so excited in my life as I was to hold leather-bound books of a game line that I wrote. Should've gotten those. They're pretty damned nice. It doesn't look like it, but you could email Steve (troll@trolllord.com) and ask. They were a limited availability like all of our leathers. They were the top tier pledge for the Kickstarter, but Steve always prints some extras for public sale after the KS is over (one great thing about TLG--we don't REALLY do "kickstarter exclusives"; we try to make almost everything available in some fashion). I do believe, however, that the Amazing Adventures leathers are sold out. I'll check with Steve and make sure, though. There's little doubt that when we do the next printing of AA (which I am hoping will include some interesting surprises and upgrades), there will also be new leathers available as a Kickstarter pledge for it. I hope that kind of material will be available in a separate book, because otherwise your effectively doing a new edition, and I got tired of that with WOTC and other companies. I don't care if you do put it in the new editions, I am just saying, if that is the plan, also plan for those of us who won't buy a new edition to still be able to get our hands on the material, even if only as a PDF. A new edition would imply that your old books would no longer work. Expanding a book with new material is not a new edition; it's just a reason to upgrade, but if you choose not to, that won't invalidate using your existing book. See the current compiled M&T for C&C. We expanded AA from first to second printing, and many versions of the C&C PHB have had corrections and upgrades. With that in mind, the call whether to make any brand new material available to those with existing books won't be my call; it'll be the higher-ups. Now, all that being said, fear not. That's not really the kinds of upgrades and surprises I'm talking about. You'll see. .